Cruises present time-honored settings for dreamy and tender moments. 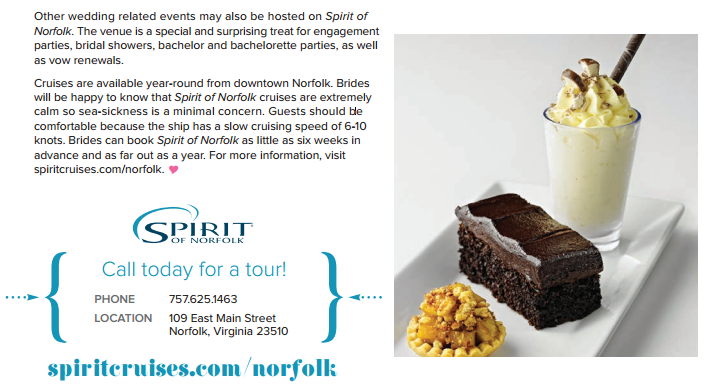 Many hampton roads residents consider the charming ship, Spirit of Norfolk, to be an enchanting setting for a love story. For the bride and groom seeking an amazing and imaginative place to celebrate their nuptials, they need look no further than the lovely Spirit of Norfolk as the venue for their wedding day. the ship’s rooftop observation deck serves as a beautiful location for a most exceptional open air wedding ceremony, and a bride and groom can begin their romantic married life by exchanging vows in the intoxicating charm of the nautical ambiance. in this unforgettable locale, a bride and groom can write the first page of their journey as husband and wife whilst treating their whole wedding party to a delightful and remarkable time of celebration. The Spirit of Norfolk is a perfect venue for the wedding host who wants to gift their guests with a treasured experience. the anticipation and excitement begins the minute guests receive their invitation, and the remarkable memory of the cruise is enjoyed for years to come. the fantastic views of norfolk’s historic downtown waterfront include the navy’s atlantic Fleet. Whether a daytime cruise highlighting the views by sunlight, or a moonlight cruise under the romantic stars, wedding guests are treated to a spectacular experience. always romantic, the ship has a fun and festive atmosphere set off by the elegance of fine dining, impressive amenities, and beautiful views. the three-story ship features a wonderful interior of two climate-controlled dining decks with bars, dance floors, panoramic windows, and a third rooftop observation deck. 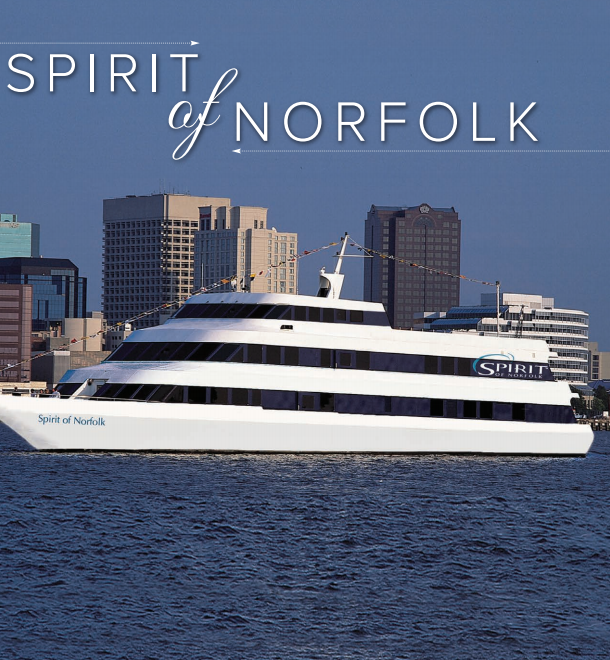 Spirit of Norfolk presents a marvelous outdoor venue for the bride and groom who would like to exchange their vows in an exceptional nautical setting. their wedding professionals take care of the ceremony details and attend to guests. Wedding ceremony packages include decorations, columns, a floral arrangement, aisle runner, and a sound technician. after the extraordinary ceremony, the guests are able to relax and enjoy a cruise without having to travel to another locale for the wedding reception.